A federal judge in May rejected the government's latest proposal for managing endangered and threatened salmon and steelhead populations in the Columbia River basin and set in motion a lengthy environmental process to explore options for the federally owned hydropower dams in the region. The U.S. Army Corps of Engineers, Bureau of Reclamation and Bonneville Power Administration own or manage 14 large dams in the basin and are close to wrapping up a traveling road show designed to secure public feedback on what to do with them. Portland is the second-to-last stop on the tour, which ends Thursday in Astoria, but the agencies will accept public comment until Jan. 17. From there, federal agencies will work on a draft environmental impact statement, which should be finished by 2020. The debate over what to do with the Snake River dams dates back more than 20 years. During that time, three federal judges have slammed the government for failing to protect threatened or endangered salmonids and for not seriously studying breaching or removing one or more of the dams on the river as an alternative. In his May opinion, U.S. District Court Judge Michael Simon said the government has done its "utmost to avoid considering" breaching or removing dams. He said the federal agencies have ignored previous judges as well and declined to "consider more aggressive changes" while continuing the same efforts - such as habitat restoration and controlling water flow to mitigate the effect on fish. "Despite billions of dollars spent on these efforts, the listed species continue to be in a perilous state," he wrote. Joseph Bogaard, executive director of the Seattle-based nonprofit Save our Wild Salmon, said the cumulative effect of the dams built in the 1960s and '70s has been devastating for wild fish. "We lost Snake River coho in the 1980s, and all four remaining populations are threatened or endangered with extinction," he said. 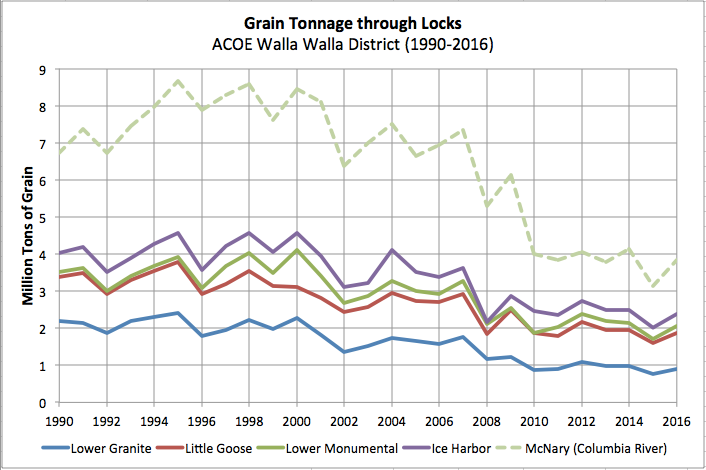 More than a dozen organizations will hold a rally outside the Oregon Convention Center at 4 p.m. Wednesday to advocate for removing Ice Harbor, Lower Monumental, Little Goose and Little Granite dams. Bogaard said removing those dams is crucial because fish will have access to more than 5,500 river miles of habitat, much of it in protected wilderness and in territory with colder water that helps vulnerable fish survive the effects of climate change. Terry Flores, executive director of Northwest River Partners, said the dams in question are "an integral part of the western energy grid. "Are fish better off in an undammed system?" Flores asked, "Sure, but the real issue is how much better will they be." Flores says without the hydropower from those four dams, states would be forced to rely on natural gas or coal for electricity. Bogaard said that's simply not true, citing recent closures or planned closures of coal-fired plants in several states and the increasing use of wind and solar power in the region. "That's a false choice that the protectors of the status quo are pushing to mislead the public," Bogaard said of Flores' statements. The meeting runs from 4 p.m. to 7 p.m. at the Oregon Convention Center. Public comment is also accepted at comment@crso.info.